When it came time to put comfort, convenience, and a splash of coolness into this home, the owner had a really good idea of what he wanted. After all, he was very familiar with the consumer electronics industry and the products in it. He just wasn't entirely sure how to get those products into this 18,000-square-foot new construction. Thankfully, Soundwaves Custom Home Integration was brought in at the very start of the project, to make sure each high-tech transition went smoothly from beginning to end. "Everything he wanted was to be high-quality,” said Joe DeMarco, owner of Soundwaves Custom Home Integration, which is based out of Gladwyne, Pennsylvania. “The system had to be simple to use and extremely stable. He had a good knowledge of the AV industry, so he knew what he was getting himself into." That's a good thing too, considering that the project took two-and-a-half years. The end result has a whole-house ELAN g! Entertainment and Control System, a Lutron HomeWorks lighting system, and 24 thermostats working to keep the family of six comfortable year-round. Music can be streamed through any of the 16 zones of audio, with surround sound systems in the great room, study, the master bedroom, and a billiards room. Everything is tied into Elan touchpads and handheld controllers, which are located throughout the house. This type of control system makes everything easy for the entire family to operate—even the family’s four children, which range in age from 10 to 16. 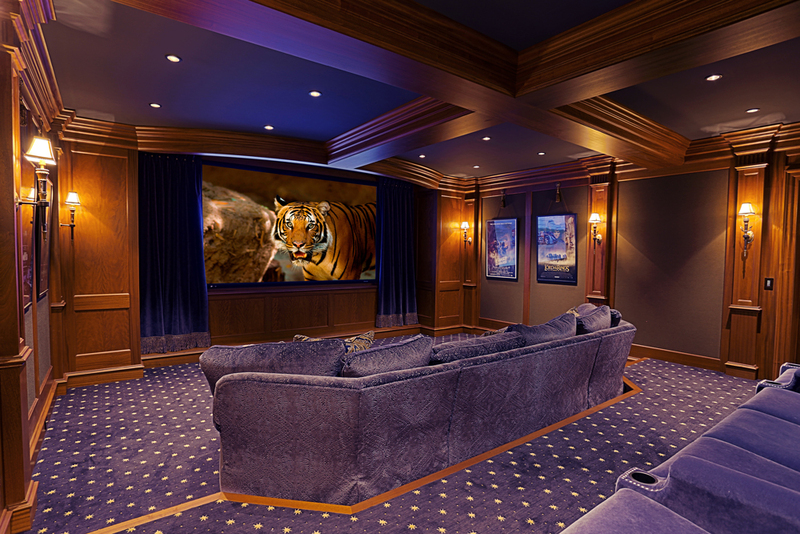 Of course, the family's favorite spot is the sparkling blue home theater room, which measures 27-by-20 feet. The lush carpet, seating, and surroundings are all eye-catching, but the overall experience is the main feature here. 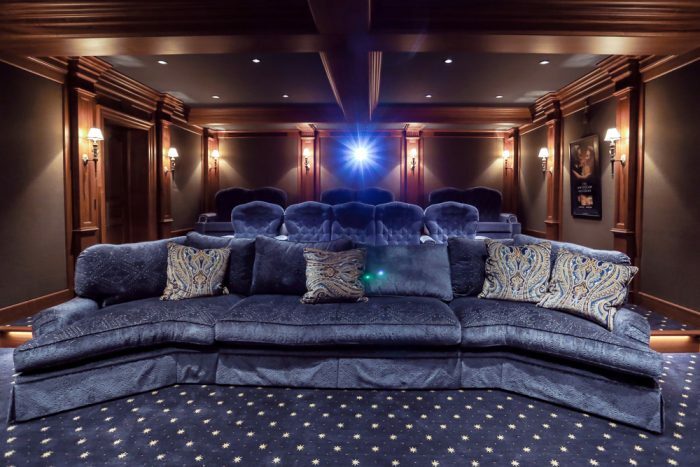 Thanks to his previous residence, the homeowner had become accustomed to having a theater room, with good sound, a big screen, and high-end products. In this new space, however, he wanted things to be bigger and better. "That’s where we came in," DeMarco said. 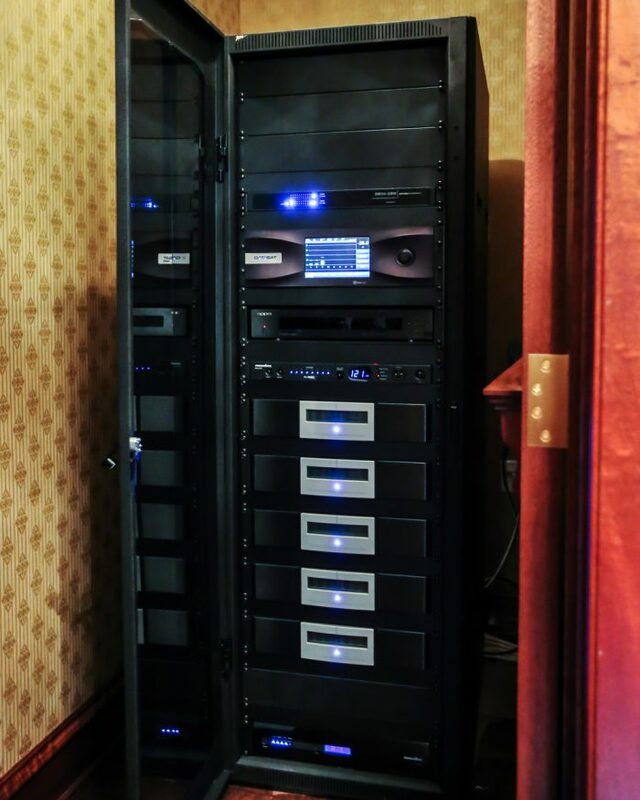 "We brought in a couple of projectors to demo in his old house before we made any decisions, and then he relied on me to design the whole theater—from sound quality, video quality, and noise control. He kind of gave me the keys and let me run with it." The room features a dedicated equipment rack, with all of the AV equipment, including a slew of source material. 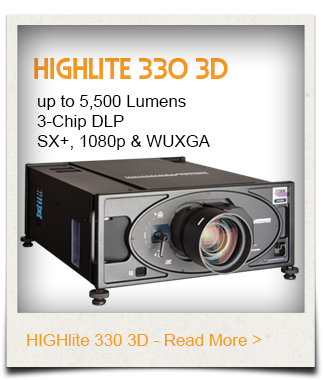 Everything can be viewed through the Digital Projection HIGHlite 330 Projector, which is housed at the back of the theater in its own closet that measures 4-by-5 feet. It may seem small, but that tiny room even has its own ventilation. 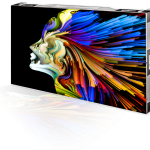 Of course, there's no hiding this projector, a 3-chip DLP that can deliver up full 1080p HD images, 10-bit color, and eye-popping 3D imagery. "It has an awesome picture and various lenses to get the throw distance that we needed," said DeMarco. "It has a very bright picture with excellent contrast and deep blacks, and it just really pops off the screen; it’s really nice." This particular unit was chosen based on cinematic picture quality, but when it came to choosing the brand, DeMarco said the decision was a bit of a no-brainer. 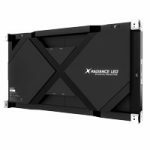 He always goes for Digital Projection (DPI), not just because of the performance, but because of his experience working with the company for the past seven years. A massive, 133-inch (diagnol), 16:9, perforated screen from Stewart Filmscreen was chosen to pair with the projector. The entire family uses it for movies, as well as sports and everyday TV watching. A Wyrestorm video matrix can deliver access to a Verizon cable box, two different TiVo boxes, multiple Apple TVs, a Fusion movie server, and a DVD player. Everything can be called up through an Elan controller. The projector, the screen, and the sources are connected to a Datasat RS20i processor, and a 9.4-channel Pro Audio Technology speaker system. Left, center, and right channel speakers, as well as two subwoofers, are located behind the screen. Two sets of surround speakers and an additional two side subwoofers fill the room with awesome sound. "They just wanted a spectacular theater room that when they’d use it, they’d absolutely love it," he said. When the family doesn't want to be confined indoors, there's an entertainment space outside, with an outdoor TV, as well a Sonance system with 24 satellite speakers and four subwoofers hidden throughout the landscape. "It sounds like a concert out there; it sounds incredible," DeMarco said.